Okay. so I don’t give up. This time I decided to use different colors – pink, purple, yellow and green. 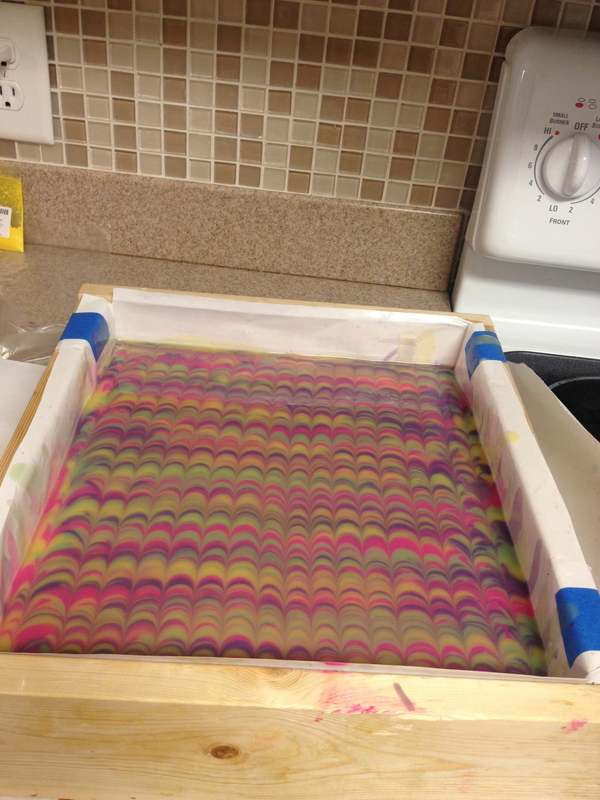 Again all the prep and actual soap making went great. I’ll skip those pics this time. 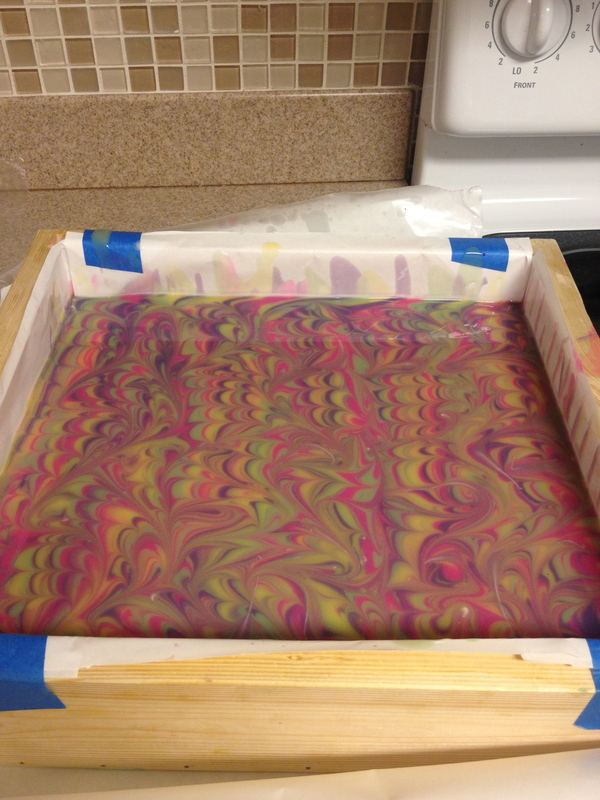 I got the soaps poured and squirted all the color. It looked beautiful when I used the rake. Now time for the peacock swirl part. I got out my chop stick and made my first pass at “S” curves. It for some reason didn’t look right. Was I supposed to do the “S” in the other direction. I turned the mold and started in a different direction. Mistake. The swirl is now ruined. The soap gremlins must not want me to learn this technique. Here’s how it turned out. A peacock swirl it is not, but If you didn’t know what I was trying to accomplish you would probably think it was a pretty swirl. No way I was going to put this in the oven. But since I soaped at a low temp I thought I best put it in the frig to insure that it didn’t do a partial gel. I sprayed with alcohol and the gremlins struck again. The soap got a film on top from the spray and as I was walking to the frig I slightly jarred the mold and one end got wrinkles. Then the colors faded. Well that is only 2 strikes and if this were baseball, I’d have one more chance. Can I actually get a batch made and keep the soap gremlins at bay???? I will post the results in the next day or two. Let’s hope the third time is a charm! 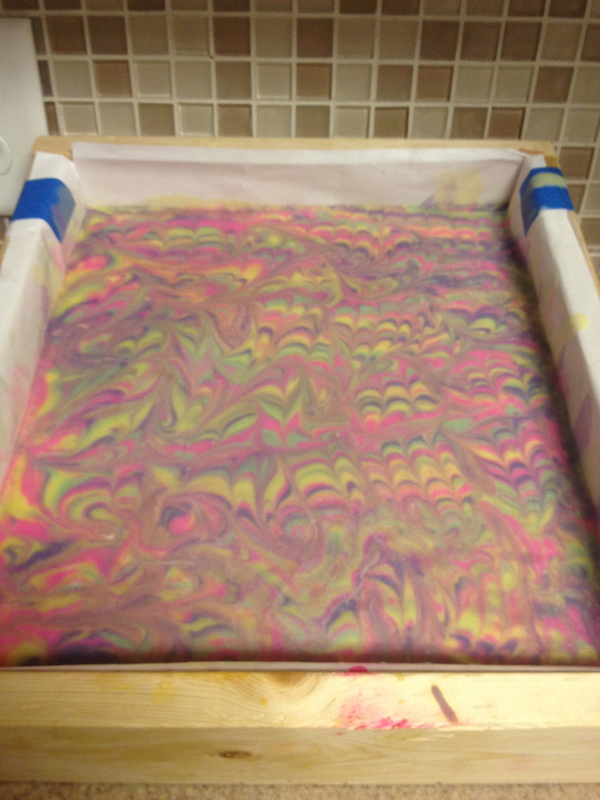 ← First Peacock Swirl – I got warts!